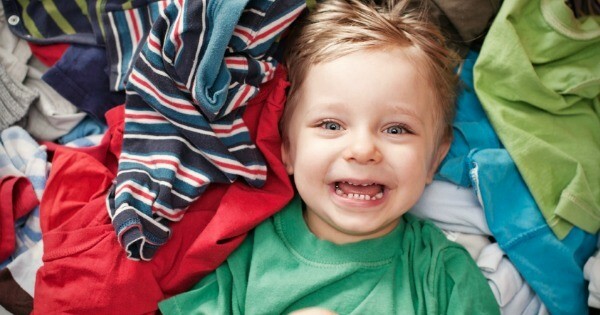 The best-kept laundry secret for busy parents - it's gold! The best-kept laundry secret for busy parents – it’s gold! Can you return your clothing to its once-sparkling white? Is it possible to remove stains from your clothes in 30 seconds? The answer is ‘yes’ to both of these questions thanks to this incredible new product. Come and take a look. What’s your most annoying chore? Mine is laundry. Laundry sorting. Laundry hanging up. Laundry folding. Laundry putting away. But what makes laundry even more frustrating is seeing the stains that are still there after all that work! Is it too much to ask for clothes to be clean after one wash? Turns out, I’ve been doing laundry incorrectly this whole time. So if you notice your son’s socks are stained with dirt, your work shirt still has a slight off-white wine stain, and the neckline of your daughter’s favourite dress is still inked with red from tomato sauce, then you need Vanish GOLD in your life. Trust me. Vanish GOLD is the latest laundry life-saver from the creators of Vanish. This is their best ever stain remover with a super boosted formula that removes stains like we’ve never seen before. Even the tough stains (ahem, wine) are gone in 30 seconds. Stains that you are positive will result in your clothes being thrown out, like tea or fruit juice, vanish with this powder gold. Pre-soaking your extra-stained items with Vanish GOLD or adding an amount (as per usage instructions) to the washing machine can make all the difference to your laundry. Sceptical? Take the Vanish GOLD 30-second challenge and discover the gold standard of stain removal. Give it a try with beetroot juice, wine, tomato sauce, soy sauce, tea or fruit juice. Simply dissolve two full teaspoons of Vanish GOLD powder into 30 millilitres of warm water. Apply 1/4 of a teaspoon of beetroot juice on a clean white cloth and spread it so you can see the stain clearly. Apply the Vanish GOLD solution immediately and cover the whole stain with it, rub it and rinse with water. What is the tough stain your kids have come home with? Have you tried the Vanish GOLD 30-second challenge? Check out their Facebook page for more great laundry secrets from other busy parents.